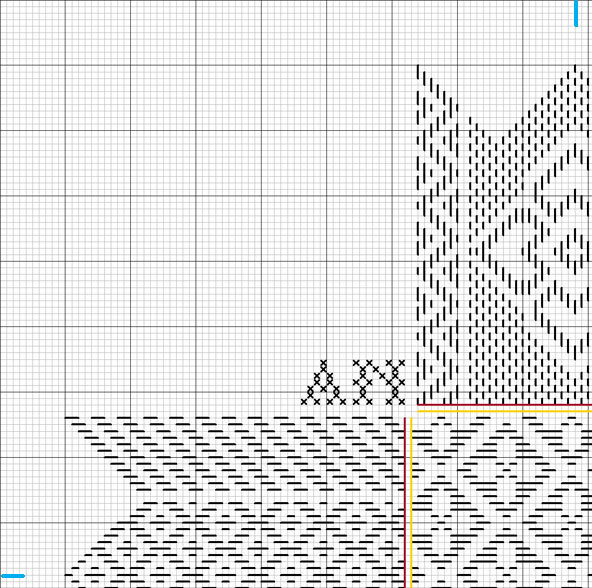 The design is 156 x 156 stitches and the design area is a 7,36 inch square for 22 ct and you will have to add to this for the edging. You will need a needle with a blunt tip. 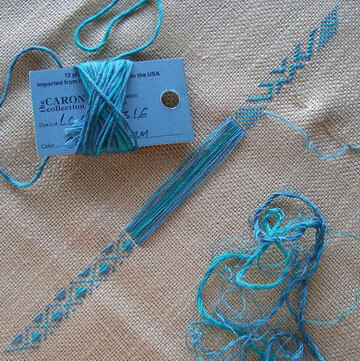 Alternatively, you may want to choose your own selection from the wonderful palette of the Caron Collection. You will need a minimum of two colours once you are ready to take the challenge! 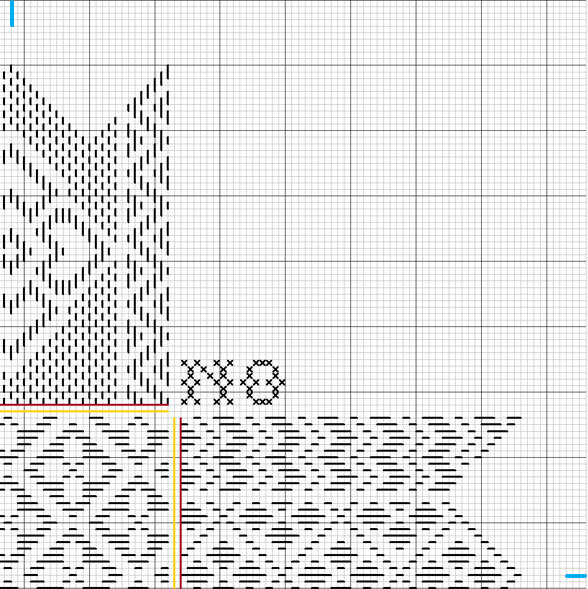 I recommend using a frame to be able to control the tension at the central block for the warp (lengthwise) lines. However, you may do without, if you believe you can make looser and even warp lines. The warp will be the basis of the weaving which, at first will be vertically parallel lines at the central block (see below). 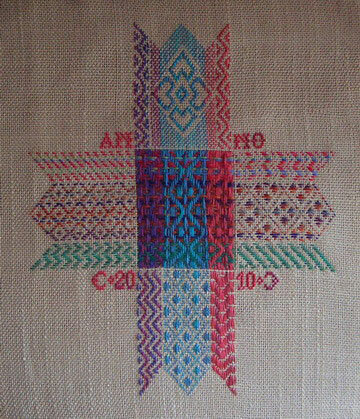 If you are new to this technique, each warp line will interpret to a stitch as you start weaving from east to west or vice versa. 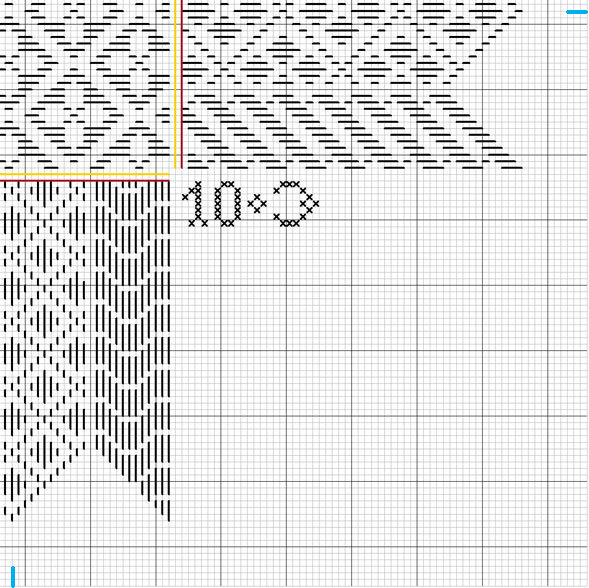 So, when you start weaving horizontally, every single running stitch that you see over the graph will mean carrying the thread over one warp line; two over two; three over three; an on … What you do not see on the graph will mean that you will carry the thread under the warp. This is a lot of fun but if you are working with two strands, you will need to pay an extra attention. 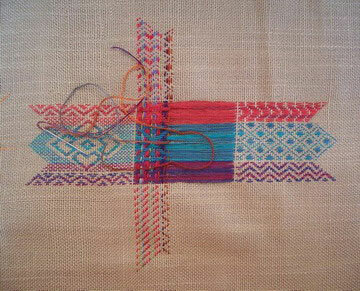 ?This is how your working piece should look once you are through with stitching the warp (lengthwise) threads. Hint : When you are ready to start with Silk Road, gently fold fabric and mark top centre. Start your decorative running stitch from the very top of the very centre line of the northern piece after leaving enough space for border/moulding. 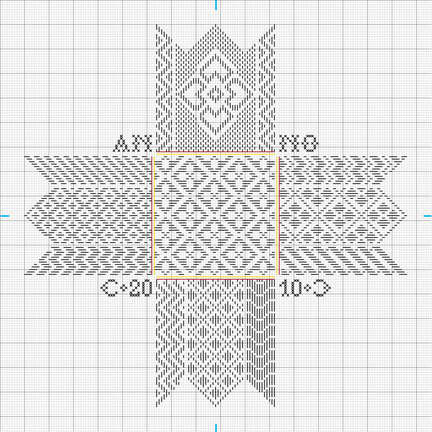 Important : As you would notice in both northern and southern pattern blocks, there are four unstitched gaps (two in each, separating the different vertical patterns). 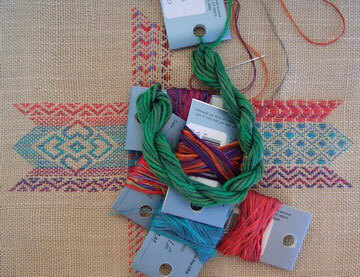 Secure your thread in a neighbouring stitch line and fill the gap over the central block by making an independent line parallel to others, thus filling the gap resulting from the unstitched corridors above and below. Repeat this for all other three gaps. Again, if working with two strands, you may choose to weave at the lower end of the warp where it will be easier to follow the strands and once the row is done, you can gently push the weft back to its appropriate position. PLEASE ATTENTION : Coloured lines on the graph are imaginary and are for guidance. 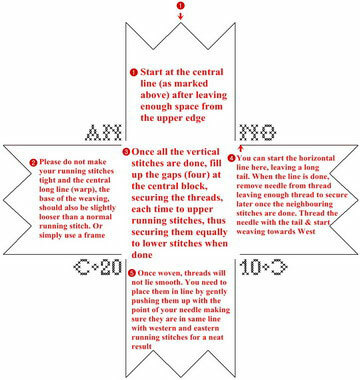 When stitching towards the central block, red lines are to instruct you that stitching for the particular block’s row or column has ended and that either the warp or weft (weaving) will start and is marked yellow. To be more precise, stitching towards into the centre; red line is where your needle goes down, ending the pattern of the coinciding block; coming back out from the yellow line, thus starting the warp or weft (weaving). 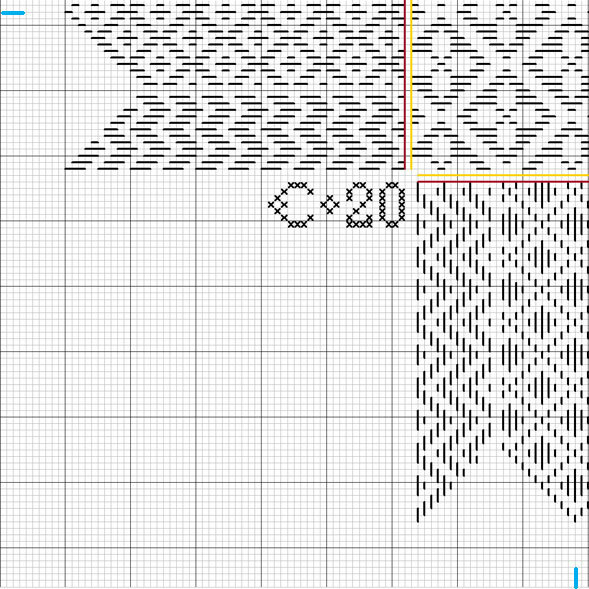 This rule/sequence is exactly the OPPOSITE when stitching from central block towards surrounding blocks. That means, once you are through with the warp or weft (weaving), yellow line is where the needle goes down, thus ending the warp or weft and red line this time, is the start of the next row or column of the block in line. Horizontal and vertical central lines (marked blue) are repeated in every section, so please plan accordingly.